Station Hotel in Thornton has accommodation. The pub has a beer garden, it has an outside area. Station Hotel has a dart board. The pub has DJ's, it has karaoke. Station Hotel has live music events. The pub holds quiz nights, it has a big screen. Station Hotel shows football on TV. The pub has Sky Sports, it has terrestrial TV. 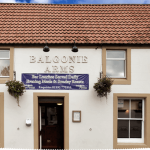 Balgonie Arms in Coaltown is a family friendly pub. The pub serves food, it has an outside area. Balgonie Arms serves real ale.